Our vegan and paraben-free formula is versatile enough to tame a spectrum of hair types, from straight to curly, and fine to super thick. It detangles, adds shine, and is also safe for chemically-treated or colored hair. Active ingredients include wild pansy, sweet clover, and apricot extracts - all of which contain our proprietary phyto-blend of nourishing antioxidants - plus amino and fatty acids which restore hair from the inside out, providing anti-aging benefits. Safflower Oil guards against heat damage and provides UV protection. To use: After shampooing with UltraShine Moisture Shampoo, apply conditioner to hair, focusing on mid-lengths and ends, then rinse with warm water. For intensive moisturizing, comb hair after applying and leave in for five minutes, then rinse with warm water. Ingredients: Water, pHytoBlend (proprietary concentrate blend of 20 herbs in an aqueous base) stearylkonium chloride, glyceryl monostearate, palm oil, mango, lecithin, sunflower oil, soya, safflower oil, soy amino acids, vitamin C, wild pansy, sweet clover, apricot, nasturtium, nectarine, passion flower, citrus seed extract. 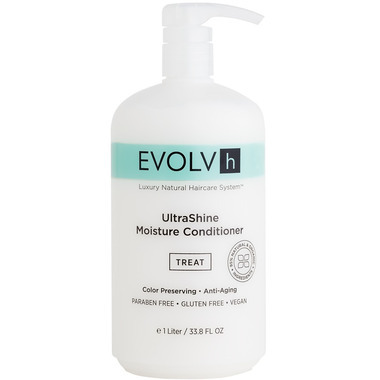 EVOLVh ULTRAShine Moisture Conditioner was a very welcome surprise; the enticing scent and the fact that I didn't need to use much to fully nourish my very long strands gives it high marks from me! It leaves my hair so incredibly manageable and easy to comb/brush out - no need for intensive conditioners/masks. I would absolutely recommend this conditioner (and their other products too, including Shampoo and Leave-In Conditioner) to anyone, and WELL worth the price. BEST Conditioner/products I have ever used!!! This is like the icing on the cake after using the UltraShine shampoo. Like the shampoo a little goes a long way...it smells wonderful and leaves my hair feeling incredibly soft and light! Salon quality with top notch ingredients that deliver perfect results! This conditioner paired with it's shampoo counterpart is amazing! My hair is usually left feeling quit coarse and heavy with conventional shampoos and conditioners. With these products, my hair has never felt softer, cleaner, or lighter. I would highly recommend them to anyone. in my life. It's like I have bounce and body in my hair I never thought possible. A little, goes a long way, same as the shampoo. The Evolvh products ARE THE BEST natural hair care products I have ever used. They are expensive but are just as good as the best high quality salon products but with safe and natural ingredients. A little of this goes a long way. Leaves hair silky and moisturized. Awesome.